Written by Janet Choi on October 1, 2015 . It worked. Not one angry response or customers lost (and only 12 unsubscribes). More than that — these pricing increase emails ended up capturing 263% more sales, leading to Appcues’s best month ever. Here’s how they did it. 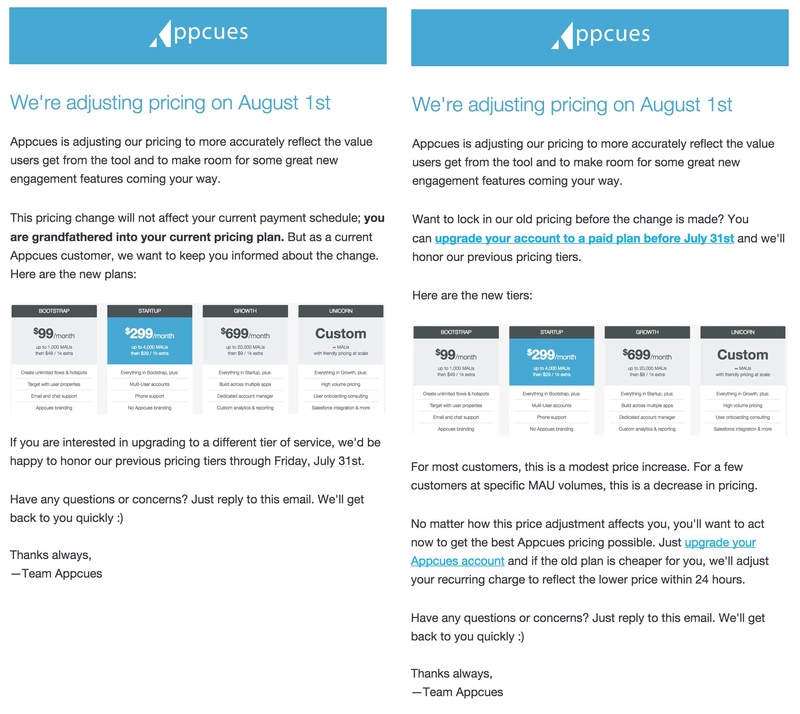 Appcues sent different emails to two different segments to notify them about the new pricing plan. The email on the left went to current customers, while the email on the right went to everyone who signed up for the app but wasn’t yet a customer. rather than sending people away to the pricing page with a link, they included an inline image of the new pricing model. The less straightforward you are about what customers may construe as bad news, the more credibility you lose. By being up front, you earn your customer’s respect and maintain the trust required to develop a long-term relationship. Never email from no-reply@company.com, especially for an email with this level of sensitivity. Not only did Appcues send their email from a friendly account, they actively encouraged email replies. And they backed up their promise by responding to queries quickly to make sure that everyone was squared away. The follow-up is crucial to closing deals, and that’s why Appcues decided to create short email campaigns for its non-customer segment. Within a broad segment like non-customers, you’ll often find a heterogenous group. In fact, the non-customer group had 8x more people in it than the customer group, which made it ripe for some deeper segmentation. For example, people currently in their 15-day trial are much warmer leads than those who tried your product out 9 months ago and barely remember who you are. So Appcues created 2 separate email campaigns for its 2 non-customer segments. 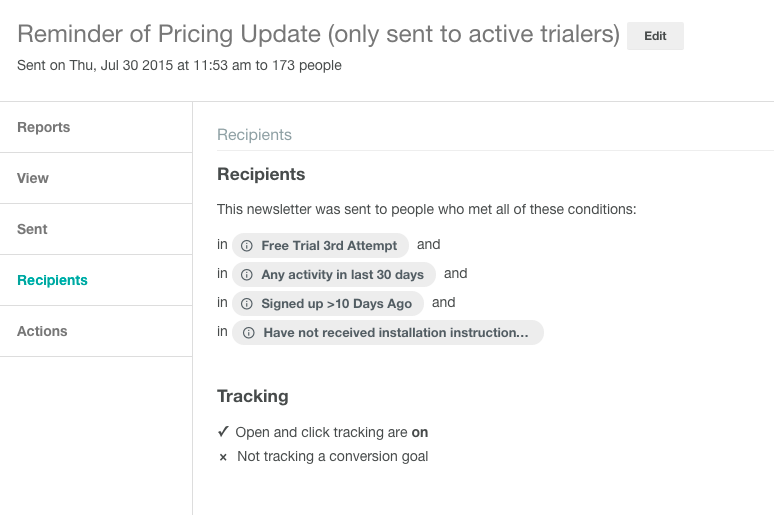 For people currently active in their 15-day trial, Appcues created a specific follow-up to the initial announcement. 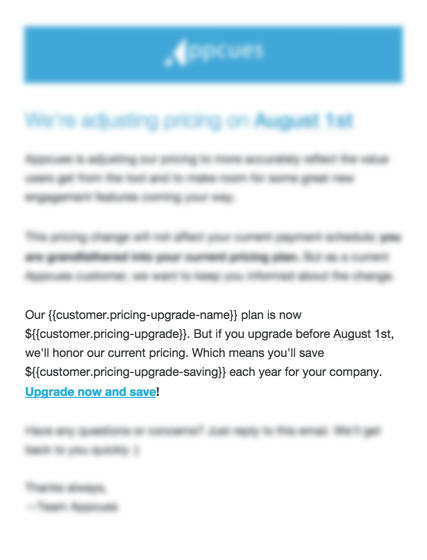 One day before the new pricing took effect, they sent a second email to this specific segment reminding them of the pricing change and giving them one last opportunity to take advantage of legacy pricing. This segment also had the most promising prospects for the pricing change. They were the most likely to convert to a paid plan compared to people who signed up several months ago. And since this was just a quick reminder to a targeted sub-segment, the email not only wasn’t annoying — it worked to move people onto their buying decision. people he hadn’t talked with in awhile. He wrote each active conversation email from scratch, drawing on the existing context of his sales conversation and without copy-pasting a template. They resembled this email: These emails were incredibly effective in getting deals from interest to close because of the personal touch. For prospects he hadn’t talked with in awhile, he copy-pasted and sent the following email to prospects that he thought had the potential to convert. He used HubSpot Sales to track opens on those emails. This email reignited interest in a number of prospects. The Calendly link made it easy to book time for a call with John, where he would warm up the lead by demoing the product. After that, he would close the deal using the promotional legacy pricing. What’s impressive about Appcues’s pricing campaign is that they were able to do what’s best for the customer and boost their bottom line, all with a pricing email that startups all too often are scared to send. By thinking through their messaging strategy, they were able to send targeted emails that persuaded people to act positively in their own interest. The Appcues team accomplished its goals, simply by establishing some basic principles, creating 2 segments, and adding the human touch. How have your pricing change communications gone? Share your story with us in the comments!